Three years ago, I got a Google Nexus 7 (2013 edition) for my parents. They like the Nexus 7, but now they want another one so each can have their own. My mom asked for something with a bigger screen, so I was looking at models in the 9 to 10 inch range. There were some pretty decent deals on iPads, but in the end I picked up a Samsung Galaxy Tab A 10.1 with 16 GB storage. 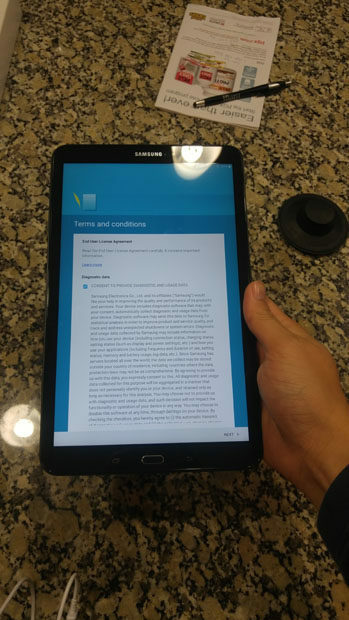 There were a lot of cheap Android tablet on the market, but I want something with a good screen and decent performance but still at a low price, and the Samsung unit fit the bill. With all discounts, it cost about $170 which is cheaper than any of the iPads. 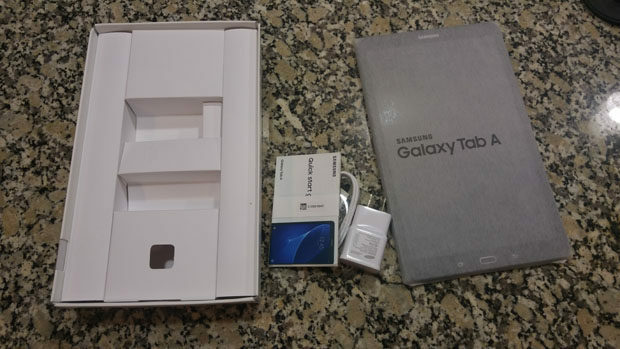 The Galaxy Tab A 10.1’s white box. 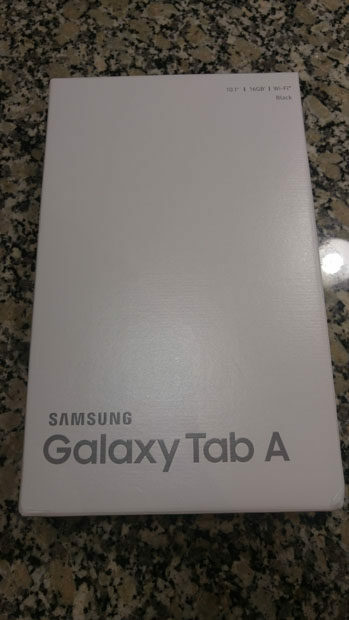 The Galaxy Tab A came in a decent-looking box. Opening the box revealed the tablet, the charger and USB cable, and the warranty and quick start pamphlets. 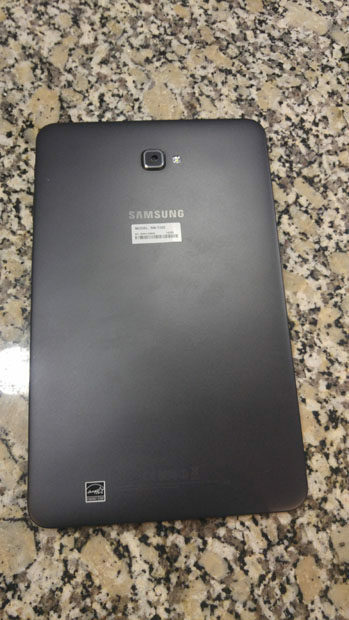 The tablet itself is black/dark grey, with a back that feels very… plastic-like. It feels like there is a separate shell on the back on the tablet. Not that it’s bad, but it just feels that way. Being a 10.1 inch unit, it definitely feels bigger and heavier than the Nexus 7. It’s definitely something that you need both hands to operate. The home button is a physical button, and unlike many tablets and phones, the micro-USB port is at the top of the tablet rather than the bottom. On the right side there is the volume and lock/power button, plus a slot for a microSD card to expand the storage. There is also a 8-MP camera on the back, and the front-facing camera is 2 MP unit. Turning on the tablet leads to the usual setup. Samsung offers some of their software and customized the interface a bit, but it is still a pretty standard Android 6.0 experience. It really doesn’t feel all that different from my phone or the Nexus 7, other than the slightly different interface and larger screen. The only thing that is really different (other than the size) are the buttons. Because of the physical Home button, all of the buttons (including Back and Overview) are always on the same side instead of moving with the screen orientation. Also, the Back bottom is on the right of Home while Overview is on the left, which is the reverse of all of the Android device I’ve used. It might take a little getting used to, but these are not a big deal. As expected with a new tablet with decent hardware, the interface is pretty quick and snappy. The 1920 x 1200 screen is sharp, and watching hi-def videos on it looks nice. I played a few games on it and the Galaxy Tab A handled it fine. The Galaxy Tab A doesn’t have the fastest hardware especially compared to the newest high-end smartphones, but it should be fine for the web-surfing and casual gaming that it will be used for. 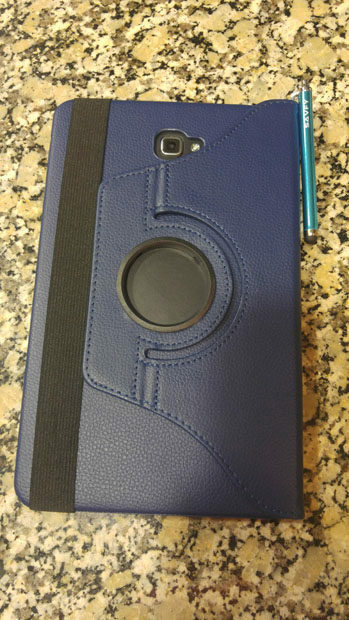 Got this dark blue rotating case cover for the Galaxy Tab A. Just like for the Nexus 7, I bought the same style of cover, but I got a dark-blue one. I like this style of case since it can support the tablet in both landscape and portrait mode. You can buy these off of eBay for pretty cheap. The whole package also came with a screen protector, but I screwed up the application and decide to forgo it. I think the case-cover will be enough to protect the tablet’s screen. 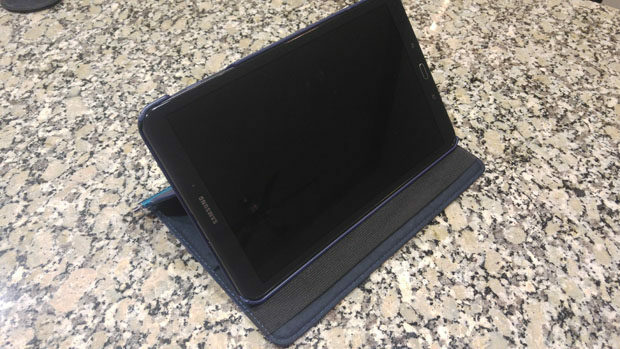 The tablet standing in portrait mode with the case cover. These are my first impressions of the Samsung Galaxy Tab A 10.1. It looks like a solid tablet, and hopefully my parents enjoy it and use it for a long time.